Big Ten basketball is here, and it ain’t going nowhere! The rumors of the Big Ten’s demise have been greatly exaggerated. Pay no attention to the shellacking that Duke handed the fearful Hoosier team on Tuesday night. Slowing down the most explosive basketball player in the nation was apparently too tall of a task for Josh McRoberts’ brother – who could’ve seen that one coming? For tonight’s college basketball slate, let’s take a look at a marquee Big Ten/Top 25 match-up between the undefeated Iowa Hawkeyes and the Wisconsin Badgers. Iowa nearly blew it but handed Jeff Capel’s Pitt Panthers their first loss in a 69-68 battle in their last time out. Meanwhile, the Badgers rebounded from their loss to Virginia to take down the NC State Wolfpack in a 79-75 thriller. Tonight, the Badgers are laying 1.5-points on the road to the Hawkeyes with the total score between two solid offenses predicted to top 143 points. Shall we begin? With the exception of a predictably ugly loss to the 4th seeded Virginia Cavaliers, the Wisconsin Badgers have been markably improved from their 15-18 team from a year ago. Ethan Happ is the focal point of the Badger attack, and he’s the best college basketball player in the country that has absolutely no shot of playing in the NBA. It’s hard to even comprehend that him and Zion are the same species let alone two athletes that play the same sport. The Badgers are looking to avenge their 18-point loss from nine months ago at the hands of a nearly-identical Hawkeye team. Happ was able to get his numbers in that game, but it will be on the supporting guys to step up to deal with the Hawkeyes potent offense. Khalil Iverson is too inconsistent. Third year guard D’Mitrik Trice has been solid but unpredictable. And Buzzcut Brad Davison fills out a White Guy Bingo cars like no other player in the NCAA, but he’s going to need to do something besides draw charges to help Wisconsin in this one. 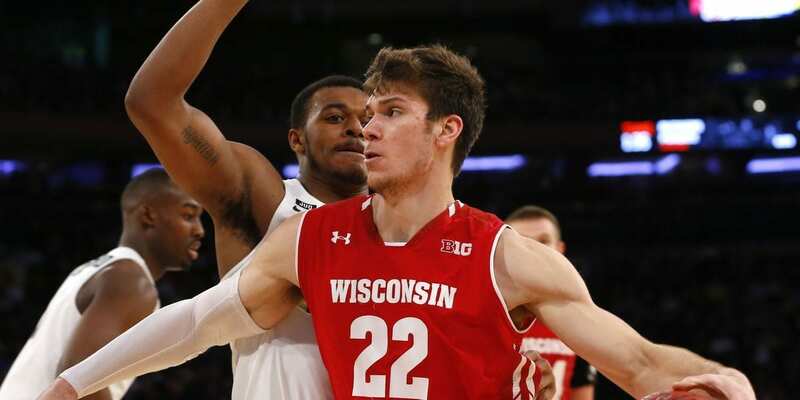 Happ has to deal with two solid defenders in Luka Garza and reserve big man Ryan Kriener, but if he can rock his opponents to sleep with his 1950s-style post-play, the Badgers have a chance to steal a road Big Ten victory. Is that what Iowa fans call themselves? It’s been a couple of years since the Iowa basketball team made its way onto my television screen. I legitimately had to check to see if Aaron White was still on the team as a super-duper-duper senior. Instead, I found a well-balanced, sneakily-good Big Ten basketball team that I’m excited to check back in on. Through 6 games, Luka Garza and Tyler Cook have been nothing short of terrific. In fact, Iowa’s five best players have all been playing magnificently, and Jordan Bohannon, their junior PG, hasn’t even played particularly well yet. This team already handled the Wisconsin Badgers last year at home, and they’re hoping for a repeat offense. Bohannon and Garza both put up double-doubles in the victory, and they will be the key to Iowa’s continued success. However, Brad Davison is an underrated defender, and Happ, despite his athletic slights, is a big-game hunter. For Iowa to rise above this challenge, Tyler Cook will have to tack onto his 17 point per game average. He promised Iowa fans that he has more to give, and it’s time for him to make good on his promise. For me, the NCAA season is about to hit a lull, so it’s always good to see two ranked teams duke it out early on. In college basketball, going on the road and winning is so hard to do, and it’s nearly impossible to do if you don’t have the best player on the floor. Happ is probably that guy, but by what margin? Both of these teams have improved upon their down year and come back with a vengeance, but Iowa has been the more impressive squad, and I like them to take care of business in their home arena. Take the 1.5-points, bet their moneyline – doesn’t matter. Hawkeyes soar and stomp the Badgers. Book it.